Modern, stunning, and well designed. This 10-storey boutique condo is coming to Roncesvalles. It’s a fresh approach to the traditional warehouse-style, with many unique private outdoor spaces. It’s a short walk to the best retail, restaurants and parks including Sorauren and High Park. 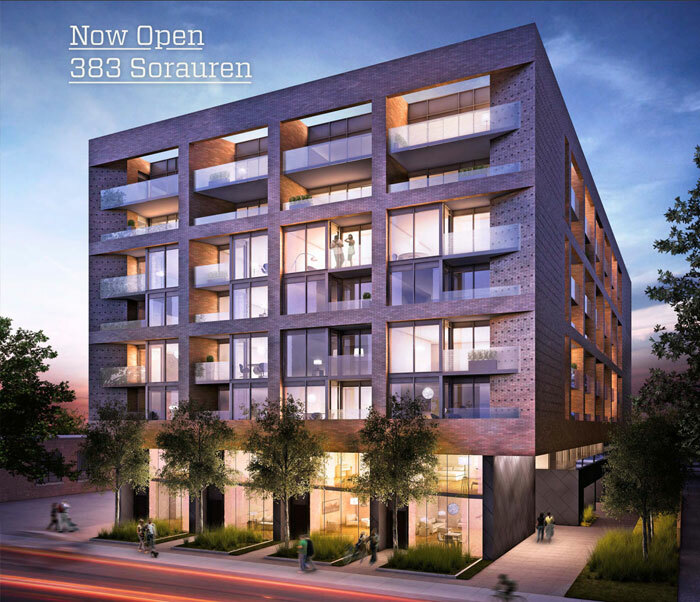 And with easy access to the Gardiner, Bloor subway, and downtown core, 383 Sorauren is sure to fit your urban lifestyle. Its mature look and feel and private outdoor spaces capture the energy of the community perfectly. Say hello to all the best Roncesvalles has to offer. Developer: Gairloch and Centrestone Urban Developments Inc.
a fresh approach to the traditional warehouse-style. Filled with all the modern conveniences you could ever want to fit your urban lifestyle. Its mature look and feel and private outdoor spaces capture the energy of the community perfectly. Say hello to all the best Roncesvalles has to offer. a friendly and diverse neighbourhood known to the locals simply as Roncy. Everything in and around the neighbourhood is very walkable according to walkscore.com. The neighbourhood earned a very respectable walkability score of 93 out of 100! Priced at $572,990 to $876,990. All Penthouses include Privates Terraces. The Sorauren Farmer’s Market in Sorauren Park is open all year round every Monday from 3pm to 7pm. Start your week off right with a trip to the Farmer’s Market and you’ll find all sorts of home baked breads, pies, organic meats, and locally grown produce. Come hungry, and leave with plenty of Ontario grown and locally produced goodness. You can always find the newest crop of seasonal fruits and vegetables, fresh cheeses, honey, and even smoked meat sandwiches. Don’t forget to bring your reusable bags. There are plenty of independent coffee shops to get you going like, Alternative Grounds, Cherry Bomb Café or Tinto Coffee House. Shop for vintage items at Frock or Hawk Eyes. Grab some groceries from Super Kolbasa, Thin Blue Line Cheese, Rowe Farm Butcher Shop, Ko Fruit Market, and Mabel’s Bakery and Specialty to name a few. There’s also plenty of dining options in Roncesvalles. You can find everything from Cajun, Greek, Asian, Polish, Indian and Thai. A few noteworthy places include Chopin Restaurant, Fat Cat Wine Bar, The Local and Brad’s Takeout and Eatery. 383 Sorauren Avenue as a condo development is basically still a fetus. The sales office just opened last weekend, and the condos themselves won’t be ready for moving day until fall 2016. As the city expands ever outward, though, condo life is getting pushed farther west. Behold: the latest condos in family-focused Roncesvalles.